Why are my trees and shrubs not leafing out? Spring is over and most plants are in full bloom. Annuals are being planted, making landscapes sing with pops of color. Trees that were bare just weeks ago now have tufts of bright green foliage, and many perennial shrubs are sprouting lush flowers. Or… at least that’s how it should be. You may now be noticing that some of the trees and shrubs on your property aren’t in the best of health. These plants may have partial foliage or none at all, and, if not handled, they can greatly diminish the curb appeal of your landscape. Here at Schill Grounds Management, we get the opportunity to plant hundreds of beautiful new trees and shrubs every year, and we know that having to replace mature plants can be very expensive and significantly change the look and feel of your property. If you’re like most owners and managers, you want to prevent this type of damage from happening to your property. 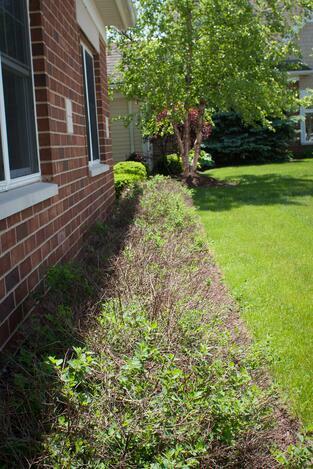 Just about every spring, we get asked “Why do some trees and shrubs not leaf out in the spring and what can I do to prevent it from happening to my landscape?” Never ones to shy away from answering hard questions, we wrote this article to provide the answers. Ohio has four seasons, but all natives know that those seasons are anything but predictable. Plants are constantly preparing internally for the changing seasons, and anything that happens to disrupt that cycle can cause damage. This can mean unseasonal heat during the winter or in late fall, or an unexpected freeze in late spring. Sound familiar? If you live in Ohio, of course it does! On top of this, as we’ll explain below, extreme cold in winter and harsh heat in summer can cause just as much injury as rapid changes. Seasonal change is hard on plants, but storms that bring high winds, excessive moisture, and lightning can cause injury too. For example, many people know that average wind speeds are vital in making trees stronger. Without it, they can eventually collapse under their own weight. But while trees do need to be able to sway in the breeze, trouble can arise when extremely high winds pull them by their roots. This displaces soil and makes it harder for the root system to absorb water. High winds can also cause branches to break and crack. Lightning, though a less common problem, causes much more damage to trees when it strikes. Usually when lightning hits a tree, there are telltale physical signs in the trunk that make diagnosis immediate. Sometimes, however, the damage isn’t evident until the tree doesn’t leaf out in spring. On the opposite side of the spectrum from stormy weather, drought is another extreme that can cause long term damage to plants. 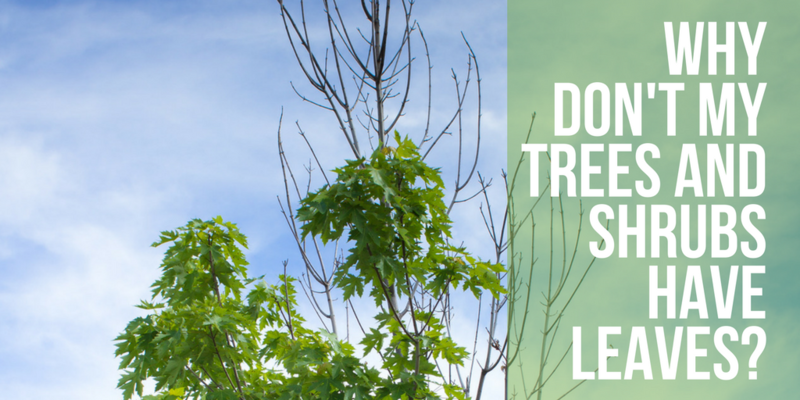 Though not a factor last year in Northeast Ohio, low water availability in summer can certainly affect your trees and shrubs in ways that can go undetected until the following spring. It’s important to increase watering during a drought if your local government allows. This may seem like common sense, but often property managers don’t think about adding more watering services onto their existing landscape maintenance contracts, or changing their irrigation solutions when harsh weather hits. 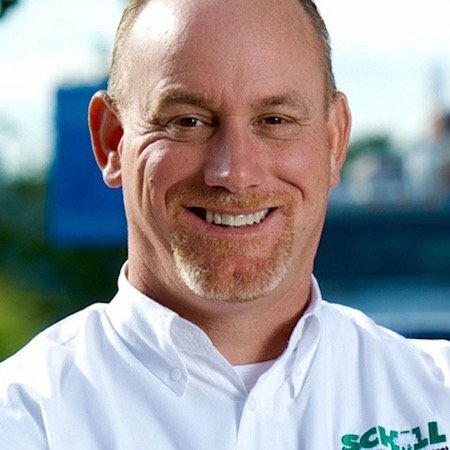 Here at Schill, we work with our property managers throughout each season to make sure that their landscaping maintenance contract meets the demands of changing weather. Like a hibernating animal, trees go dormant over the winter. 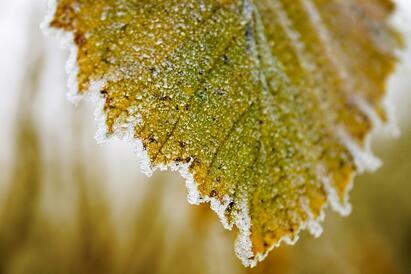 But severe frost can still damage these plants. Trees and shrubs might be unprepared if winter weather begins early or temperatures drop rapidly, as they never have enough time to go fully dormant. Thirsty plants can’t retrieve water from the soil well when its frozen, which makes them vulnerable to a condition called winterburn. Basically, these plants will show the same signs of damage as a plant in spring or summer that doesn’t get enough water. And just like freezing water creates potholes on our streets, frozen moisture on trees causes bark to contract and splinter off. This might be just an eyesore come spring, but warmer weather can expose these cracks to a host of diseases that could cause your plant to die or not leaf out the following year. Normal winter maintenance can also damage your trees and shrubs. Snow plows can hit your plants, causing injury that’s sometimes not noticeable until the following spring when branches don’t bloom. Removing ice in a timely manner is a key part of making sure your property is safe for employees, tenants, or customers. The two main choices for handling ice on walkable surfaces are salt and liquid deicer. Because it gets applied before snowfall starts, some property managers are hesitant to make the switch to liquid deicer. Why pay for a snow team to come out to your property before it starts snowing? But using liquid deicer often results in a quicker clean up time, allowing you to save money in labor. Liquid deicer can also be sprayed much more precisely than salt. Salt spreads as it’s sprayed, which results in coverage that’s less controlled. So, while the intended targets are the sidewalks and roads on your property, there’s really no way to ensure that salt doesn’t land on your plants as well. When this happens, salts dehydrates plants, making it so they can’t get necessary moisture. At Crocker Park last winter, we convinced the property management team to switch from salt to a liquid deicer, and the results this spring couldn’t be clearer. The large property usually has around 20 damaged trees per year that need replacing. This spring, the number was under 5. This is a saving of thousands in labor and new plants. Harsh weather is completely beyond our control. 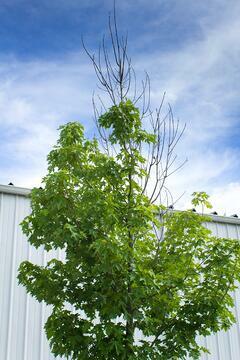 But many of the issues that lead to damaged trees and shrubs can be prevented with proper planting and maintenance. Common mistakes like overcrowding trees and shrubs, leaving tree stakes in too long, and poor plant monitoring can all cause serious damage. Overcrowding is a common problem that often occurs when landscaping is first installed because many managers want the property to look mature from day one. This means planting trees and shrubs that are larger in general. Over time, however, it’s important to monitor plants and ensure that each one has enough space to thrive and prune ones that are overgrown. Trees and shrubs that are planted too close together often have root systems that overlap and become twisted. This makes them have to compete for resources like water and sunlight. Just like stress makes humans weak, this type of stress is bad for plants. Even healthy plants can threaten surrounding ones if they’re allowed to overgrow. This tends to happen more often with shrubs than trees. Pruning is necessary to improve the health of your trees and shrubs. Trimming plants allows for the removal of diseased branches. All successful landscapes begin with a plan that considers size, location, nutritional needs, and sun exposure, so be sure to consider these factors when selecting your trees and shrubs. We’ve already talked about how drought can affect tree health, but you don’t want your trees and shrubs to be planted in a spot where they’re getting flooded all the time either. Just like a person’s skin will begin to decompose if left in water too long, plants placed in soil that is not well-drained can also begin to decay. This condition is commonly referred to as wet feet. your property has drainage issues, make sure your landscaping company has a plan to deal with excess water. For a more permanent solution, consider regrading your property, cleaning your gutters, or installing a bioswale. Just like humans, plants require a balanced diet. You need your vitamins, and your trees and shrubs need fertilizer that gives them key nutrients. The Schill team takes great pride in using fertilizer that treats your plants and the surrounding soil, providing holistic nutrition to both. Plant diseases are another silent killer of trees and shrubs because their symptoms are much subtler than the ones caused by insects and weather damage. People who are sick sometimes need medicine to recover, and plants are no different. Here at Schill, we inspect all our properties multiple times per season at no charge to our clients, looking for signs of common diseases and harmful insects. While a majority of arborist will advise you not to use them if you can avoid it, tree stakes can provide extra support for a developing tree until its roots have time to anchor themselves to the soil. Unfortunately, leaving tree stakes in too long is a common mistake. 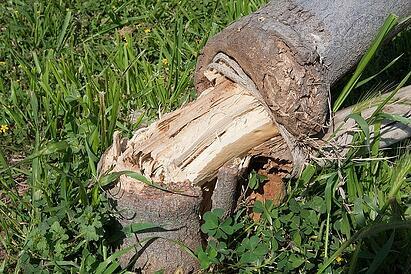 This can cause trees to grow around the stake (called girdling), becoming weaker over time. Ideally, tree stakes should only be left on for one winter cycle and should be examined twice annually to make sure they are tight and not damaging the tree. If more support is needed after 1-2 growing seasons, stakes should be removed and completely readjusted. Don’t wait until summer to remedy the problem! Now is the perfect time to remove those damaged plants and bring your landscape back to life by replacing them with something new. Spring provides warm days, cool nights, and plenty of rain, making it the perfect time of year for planting. Plus, you’ll have plenty of time to enjoy the changes all summer long! The Schill team wants to help. Contact Schill Grounds Management today to schedule a free Quality Audit with one of our landscape professionals. Photo Credit: Girdled Tree by David O.